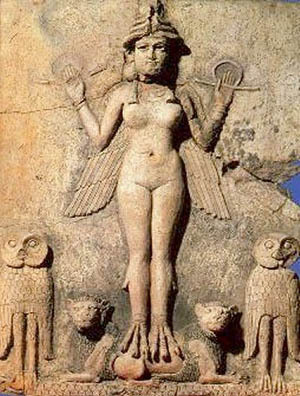 I am Ishtar, known to you as the goddess of fertility and love, through this long way of harmony and disharmony your lights will be ready, soon enough, to reunite under the veil of protection of our mighty Christ. Do not doubt that the day of your salvation is about to come, be it coming from the ground and soil of your earth or from the heavens through cosmic radiations. This whole project has been meticulously programmed for each one of you and you will understand with all your love and caring nature that the path is long but that it will be worth. Don’t be afraid more than your own body can support because the liberation of this element will not only help you to remain in faith but will also aid you in curing your physical and psychic illnesses; let me tell you that the day of your liberation has never been do close, so close to you, so clear and tangible. Let me also send you this message, the future legions of the white fraternity will be followed through an “intercosmic and divine tube” with its roots on Mars in order to assure you the proximity and security of your planet. In this sense, King Casimir will come to you through meditations, astral projections; to orientate you and elevate you to the perfection that each of you holds inside.I inform of the existence of days that might be tougher, confront this days with firmness and dedication because these are the notorious elements of one of ascensions leathers. The firmness that is equivalent to a crystal’s one that will not break is not always an element that is easy to conquer, know though that each of you has its seed and the will to activate it when the needed conditions have arrived.I am the queen of one of the several veils of this universe and I have been meticulously observing you, one by one, with peace on my mind to know that a lot of work has been done and more work is to come, it will not always be an easy path to follow but in the big picture it will be a safe path because we know what each of you needs, what speed is your to take, and what bonds there are responsible for the concretion of a new, universal monarchy coming form the Earth. The ascension you long so much for is a virtual vehicle of cosmic elevation that reflects itself, not only on this level but in all the others. Note that your veins, your cells, and organs will contract themselves for an undefined amount of time but this is in order to free themselves for the new vibrations that are to arrive.I come to you through this message to tell you that your work will be compensated but focus and acknowledge this even more, it IS being compensated as we speak, even if untouchable and invisible to the eye.Trust in me and trust in yourselves shall be. I will bring now to you one of the most valuable lessons you will need among this journey; Freedom is the hardest nexus to acquire, it works like a fishers net that is searching for its fisher, this fisher is trying hard to stay on his feet in his boat to find the fish. This nexus, even if abstract will be the most necessary for you to travel, reunite as one inside our big ship on the day that the veils of humanity will be nothing more than an indirect translation of the acts that were committed in the past.Everything is at your reach if you desire for it. At this moment there are various legions among you ready to aid you, some of them you will notice clearly. New legions and masters will follow because this also represents a period of renewal for our cosmic hierarchies.Among you are our children, our successors, our beloved in the form of seeds. They will be part of you just like you are part of them, and they will be contributing for the needed dismantlement of the plans that are now, still occult. I is necessary to follow your path of safety but know never forget the pleasure of jumping to a higher point, to use this energy you have that will lead you. This energy is intuition and even if apparently not being logic it is the most pure of all logics. Let me congratulate you for your efforts and dedication, I too feel you close to my heart and I am sure you will feel me too.A knot of light in all of you, for I AM Ishtar, the goddess of faith in your hearts.